Happy Saturday and Happy New Year’s Eve! 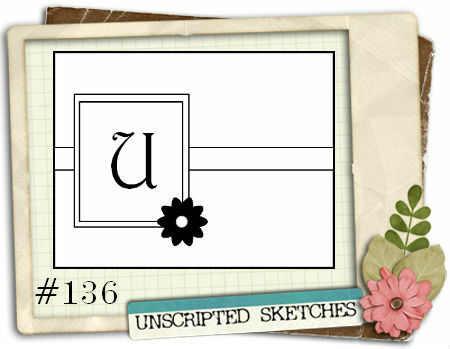 I’d like to share my final card as a member of the Unscripted Sketches design team…I’m transitioning to a new opportunity in 2012! After being a member of the team for over a year, I thought it was a good time to step aside and create a spot for a new designer to step in and become a part of the team! Unscripted Sketches was the first design team that I joined, and I’m so honored to have had the opportunity to create with the fabulous ladies on the team! I wish each of them the best, and I plan to play along with Unscripted Sketches again soon, and I hope you’ll find time to play along, too! Here’s my card! I took the picture when we were traveling for Christmas…since I didn’t have my light box with me, I had to improvise! 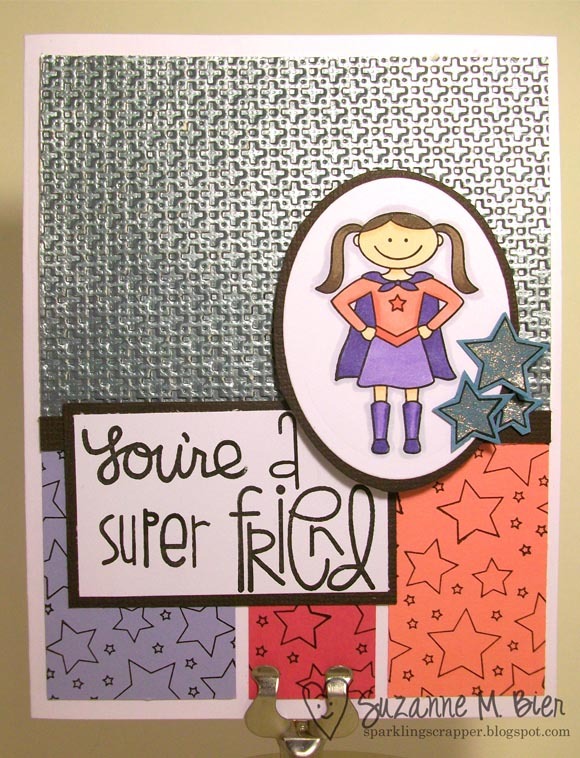 Supplies: card base, patterned paper (Basic Grey – Out of Print), image and sentiment stamps (Priscilla – Kraftin’ Kimmie Stamps), embossing folder (Sizzix), adhesive gems (aMuse Studio), ink (Tsukineko Brilliance), Copic markers. Thanks so much for stopping by! I hope you have a safe and wonderful new year celebration…see you in 2012! Happy Saturday and a merry Christmas Eve! It’s time for another Unscripted Sketches challenge! If it’s Christmas or Hanukkah where you are, I hope you’re enjoying the holidays! Supplies: fox image and sentiment stamp (Lawn Fawn), flower image stamp (aMuse Studio), patterned paper (My Mind’s Eye mini pad – I think it’s the “Be Merry” collection, which is retired, but somehow I found a mega pad at a local craft store. 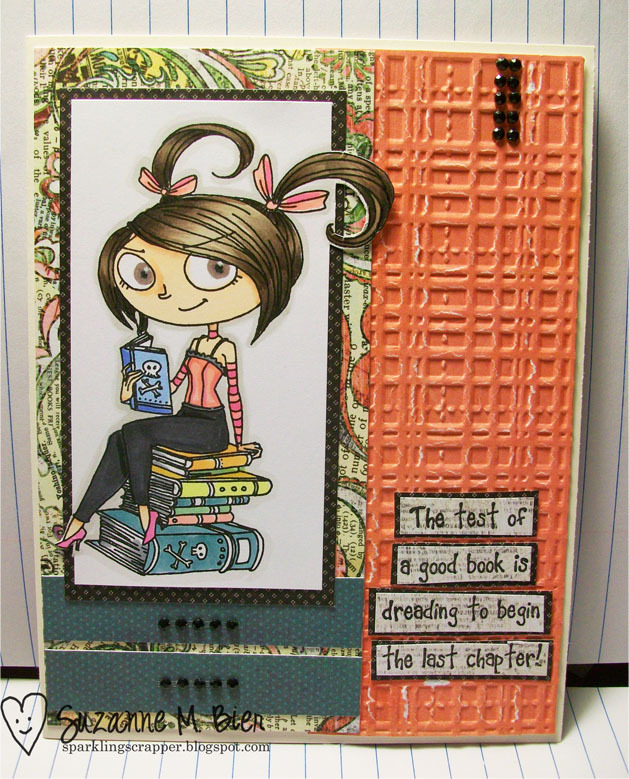 ), Copic markers, embossing powder, adhesive gems, card base, deckle scissors. and here’s our sketch! I hope you’ll find some time to play along with us this week! 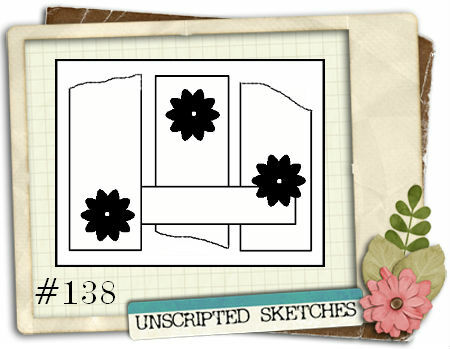 And also, don’t forget to link up your entry for this week’s challenge at the Unscripted Sketches blog for the chance to be picked as one of this week’s Top 3! 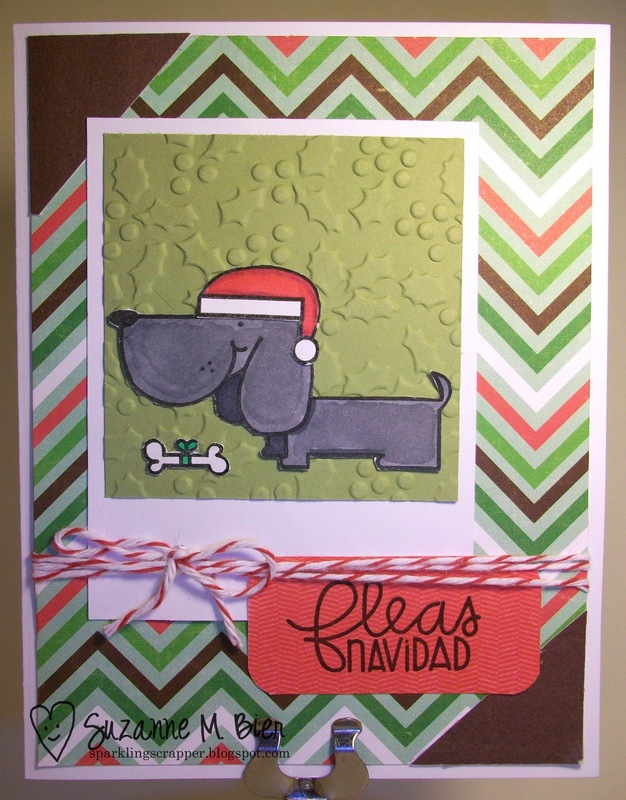 Supplies: card base, image and sentiment stamps (Paper Smooches – Santa Paws), ink (Tsukineko Brilliance – Graphite Black), paper (Echo Park – Holly Jolly Christmas), Copic markers, cardstock, twine (Divine Twine). I love this stamp set! I usually color my dogs grey (black doesn’t show up that well) to match my dog, Midnight, who is a black dachshund mix. I love that the dog in this set is a dachshund! I hope you’ll find time to play along with us this week! This is a very versatile sketch that can be modified for lots of different creations! 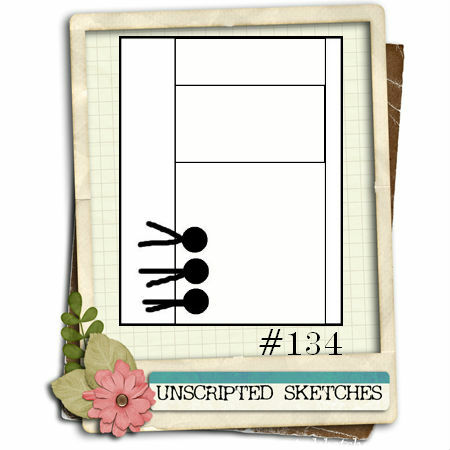 Don’t forget to visit the rest of the Unscripted Sketches Design Team: Arielle, Billie, CherylAnn, Debbie, KathyJo, Linda, Loes, Rudlis, Sarah Kaye, and Susan to see what they’ve created with this week’s sketch! Thanks for stopping by! Don’t forget to link up your entry at Unscripted Sketches for a chance at being selected as one of our Top 3 for this week! Welcome back for another Unscripted Sketches challenge! We’re featuring a very versatile sketch for you this week! If you haven’t played along with our challenges before, every Saturday morning, we post a sketch for the week. Flip the sketch, rotate it…make a card, a scrapbook page, or anything your imagination comes up with! There’s no right or wrong way, as long as you’re using the Unscripted Sketch as the inspiration and basis of your creation! 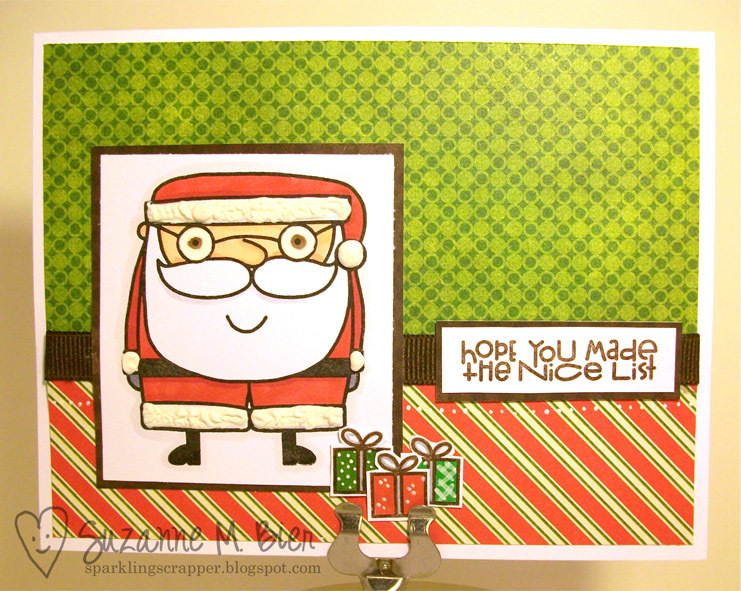 Supplies: image and sentiment stamps (Paper Smooches – Santa Paws), ink (Tsukineko Brilliance), Copic markers, card base, cardstock (Stampin’ Up! ), Liquid Applique, white opaque pen, patterned papers (My Mind’s Eye – 12 Days of Christmas), brown grosgrain ribbon. Don’t forget to visit the rest of the Unscripted Sketches Design Team: Arielle, Billie, CherylAnn, Debbie, KathyJo, Linda, Loes, Rudlis, Sarah Kaye, and Susan! 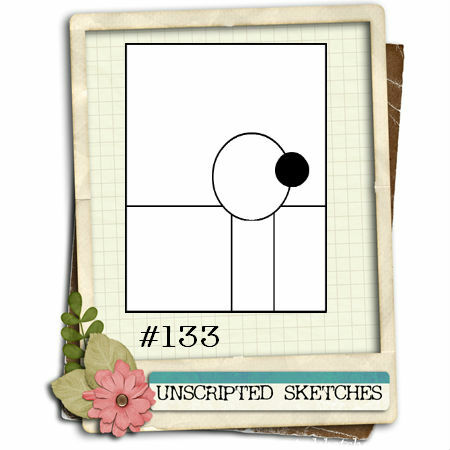 And also, don’t forget to link up your entry for this week’s challenge at the Unscripted Sketches blog for the chance to be picked as one of this week’s Top 3! Happy Saturday! 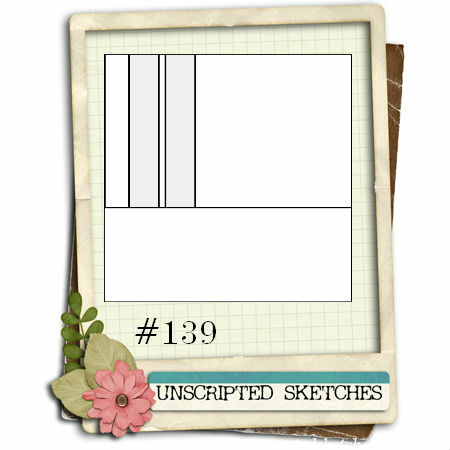 It’s time for another Unscripted Sketches challenge! Just when I thought I was done with my Christmas cards for this year, I’m pretty sure there are a few more left to make! I think the hardest part is figuring out what the design will be! This week’s sketch at Unscripted Sketches would be a very easy one to work with! 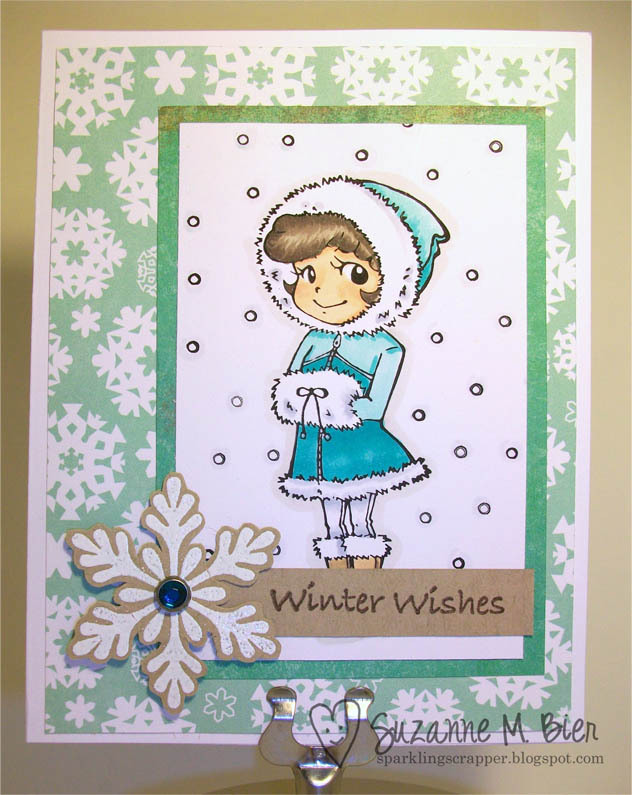 Supplies: image stamp (Snowbunny Lucy – Sparkle Creations Rubber Stamps), sentiment stamp (Imaginisce), snowflake stamp (aMuse Studio), ink (VersaMark, Tsukineko Brilliance – Graphite Black, Stampin’ Up! 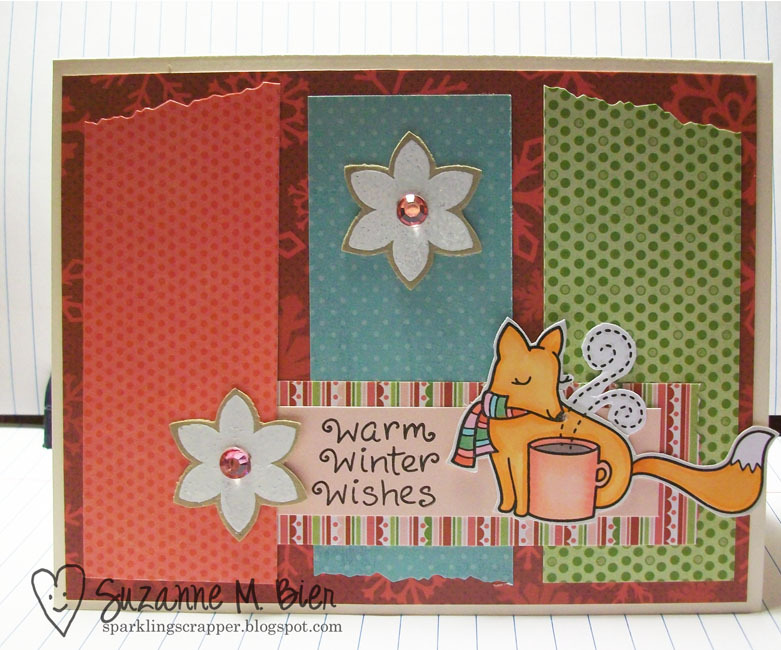 – Chocolate Chip), embossing powder, gem brad, Copic markers, patterned paper (My Mind’s Eye), card base. Here’s our sketch for this week! Instead of the four smaller pieces, I substituted one larger accent. I hope you’ll find time to play along with us this week! Don’t forget to visit the rest of the Unscripted Sketches Design Team: Arielle, Billie, CherylAnn, Debbie, KathyJo, Linda, Loes, Rudlis, Sarah Kaye, and Susan! 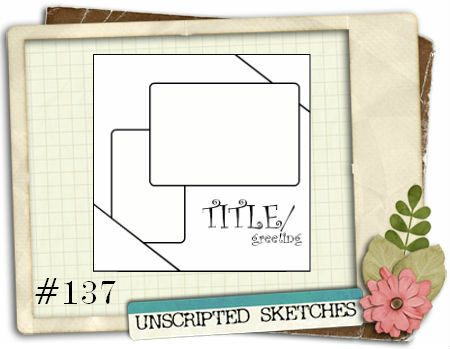 You can link up your entry for this week’s challenge at the Unscripted Sketches blog! See you there! 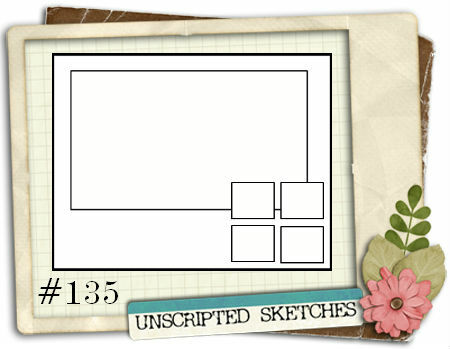 Happy Saturday and welcome back for another Unscripted Sketches challenge! If you celebrated Thanksgiving this Thursday, hope it was wonderful! Here’s my card for this week, it’s a few days late for Thanksgiving, but I still wanted to share it with you! If you’re discovering Unscripted Sketches, every Saturday morning we post a sketch for the week. 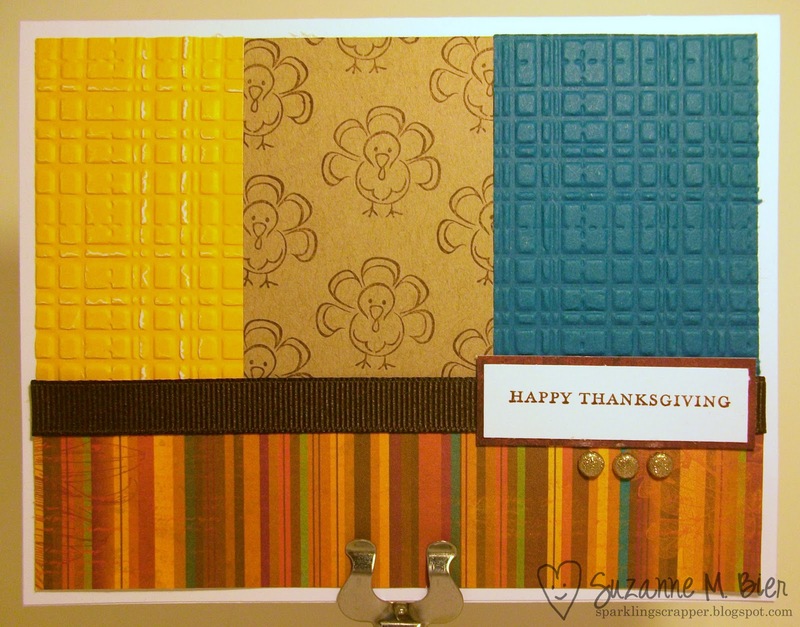 Flip the sketch, rotate it…make a card, a scrapbook page, or anything your imagination comes up with! There’s no right or wrong way, as long as you’re using the Unscripted Sketch as the inspiration and basis of your creation!